Altec Lansing invented the first DUPLEX® Loudspeaker System in 1941 (some sources say 1943 – we’re really not sure). 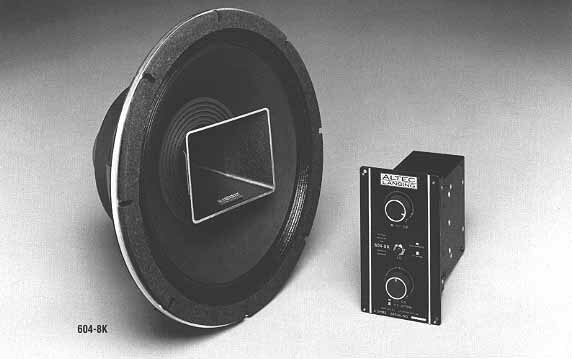 Called the “601”, it was of the field-coil type and included a small-format HF compression driver mounted to a 12″ low frequency loudspeaker with a hole bored through the pole piece of the woofer which connected to a 2 x 3 multicellular horn. Thus began the famous DUPLEX® series of loudspeakers. In 1944, the first of the world-renown ALTEC “604” series of DUPLEX®Loudspeakers (left) was introduced. 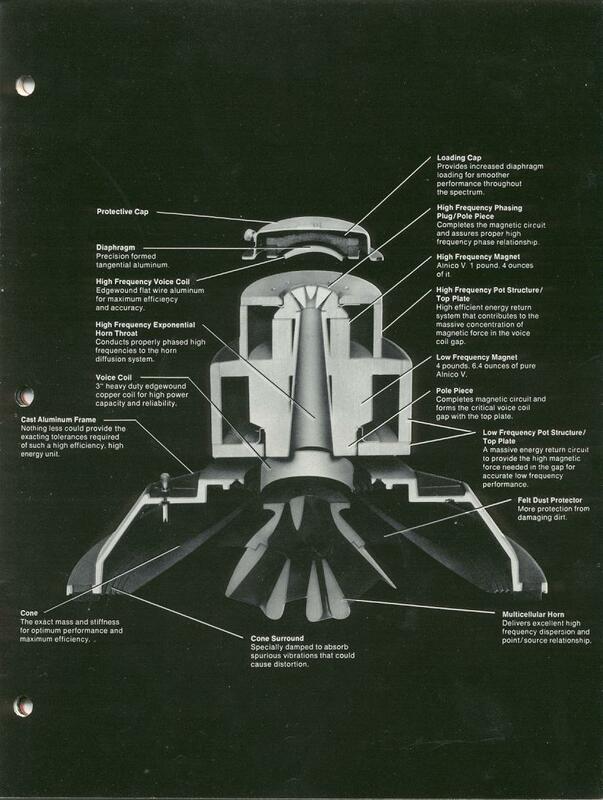 It utilized a new, permanent magnetic structure of Alnico V, had a 15″ low frequency loudspeaker with a high frequency compression driver mounted to the rear of it’s magnet. The high frequency sound waves traveled through a hole bored through the low frequency pole piece, exiting through a small multicellular horn. Later versions (C through E) used sectoral horns with vanes. 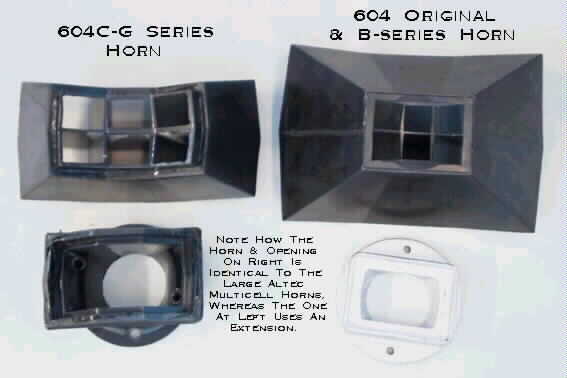 The most recent 604 (K-series) used a small constant-directivity MANTARAY® horn (see image below). C-G style on left, original & B style on right. Note the original and B style horn is a true, multicellular horn (cells go all the way back to the mouth of the throat), whereas the C – G style uses an extension to connect the smaller horn to the pole piece. This difference is quite hearable, as the low frequency loading on the larger horn, coupled with a lower crossover point, giving it more naturalism and presence. The origin of the concept of the ALTEC 604 DUPLEX® has been in dispute for many years. Devotees of James B. Lansing asseverate that he designed it, but the plain truth is that he didn’t, although he did design the tooling to build it. The original ALTEC 601 DUPLEX® was, as mentioned above, a field-coil device, assembled from units already in the Lansing® line when George Carrington, Sr. and the All Technical Services Company purchased the nearly bankrupt Lansing Manufacturing Company in 1941. 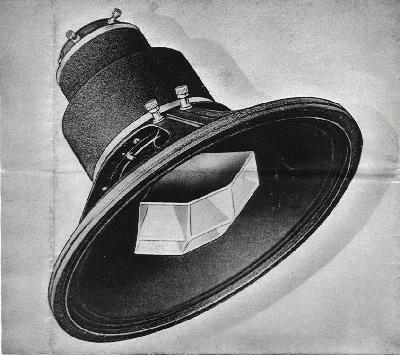 In all likelihood, the idea for a point-source loudspeaker system originated with Art Crawford, but it was Carrington – not Lansing – who, according to the late Alvis A. Ward, was intrigued by the concept, and authorized an Altec-built system of this type. Design work for the original ALTEC 601 DUPLEX® was, in all probability, performed by Carrington, who was himself a very capable engineer in his own right. Ward, who was with Altec from the ERPI days in the late 1920’s all the way through the sale of the Company to Gulton, confirmed to the owner of this site in writing that, contrary to the propaganda promulgated by JBL and others, the ALTEC 604 DUPLEX® was NOT conceived by James B. Lansing, but, rather, was the brainchild of George Carrington. According to Mr. Ward, Jim Lansing’s ONLY real contribution to the development of the ALTEC 604 DUPLEX® had to do with the fabrication of the tooling for, and manufacture of, the now famous speaker, seeing as how he was in charge of manufacturing at the time. In reality, the real reason his name appears on the press releases and papers of the day was political. Seeing as how Lansing did fabricate the tooling necessary to manufacture the ALTEC 604 DUPLEX®, Mr. Carrington agreed to allow him to introduce it, since it was, after all, built in the Lansing shop using many of Lansing’s materials. Mr. Bill Hayes, longtime employee of Altec Lansing, and Head of Acoustical Engineering from 1973-83, has said repeatedly over the years that Jim Lansing’s initials don’t even appear on the original drawings for the ALTEC 604 DUPLEX® and that he (Lansing) didn’t have anything to do with the actual design of it at all. Empirical proof of this is seen (and heard) in JBL’s laughable knock-off of the incomparable ALTEC 604 DUPLEX®. Seems to this writer if he had, JBL would have been able to do a better job on their own unit. . .
Often imitated, but never duplicated, the ALTEC 604 DUPLEX®has been heralded the world over for its ability to reproduce sound accurately and in proper phase. It is still the BEST sounding point-source loudspeaker in existence today. Altec Lansing was purchased by Gulton/Electro-Voice in 1983. Later, Gulton sold it’s audio division containing Altec Lansing, University Sound, and EV (among others) to the Mark IV investment group, which turned it into Mark IV Audio, which killed the Altec Lansing Corporation. Then, it was sold to the Telex Corporation, which subsequently sold the brand name to Altec Lansing Technologies, formerly known as Sparkomatic. At that point, the 604 ceased to be produced by Altec Lansing. Fortunately, Bill Hanuschak, owner of Great Plains Audio, Inc., purchased the tooling to manufacture the famous speaker from Telex, and it is hoped that this wonderful product will be introduced to the marketplace soon!